Are you looking for a way to make your home warmer and reduce your energy bills? The Green Deal could be the answer. If you are a home owner, a tenant or a residential landlord, you can benefit by using the savings from your energy bill to pay for energy efficient improvements to your home. We can help you install loft, cavity or solid wall insulation, a new boiler, or even renewable energy such as solar panels, that can make your home more comfortable and cheaper to run. Although the Green Deal Finance Company is no longer offering loans, we can still offer you a number of ways to pay for the improvements – including low rates through your local Credit Union as well as personal finance, credit card or from your existing savings. There are also incentives available to help you improve your home. Some of these are for qualifying householders only – such as those receiving benefits – but many are available to all. These change often so, to find out what’s available right now, please get in touch. For impartial advice about the Green Deal and whether it’s right for you, see our Green Deal advice page. Local Energy is a small company, so we can offer you a personalised service. You can ask for us by name and be sure to speak to the same person each time you contact us. Although we’re small, we have already delivered more than £25million of ECO funding (the grants that help support Green Deal and the installation of energy efficiency measures), as well as a number of Green Deal plans for households up and down the country, so we have plenty of experience to help find you the best Green Deal package. If you’re considering energy efficiency improvements for the first time, we can help you consider all the options to find the best one for you. We will arrange for an assessor to visit your home to carry out a Green Deal assessment; the recommendations on this report are used to put together your personalised quote. If you have already had a Green Deal assessment, we’ll be happy to prepare a Green Deal Plan for you based on your existing report. We’ll arrange a time to visit you to discuss your Green Deal Plan and answer any questions you may have – or we can arrange a phone call if you prefer. Of course, we’ll also be happy to answer any questions by phone or email at any time. When you choose to go ahead with your Green Deal Plan, the work will be carried out by local installers wherever possible. This cuts down their travelling time and keeps the cost low for you. We have offices in London and Manchester, but we work with installers from Newcastle in the north to Portsmouth on the South coast – and everywhere in between! 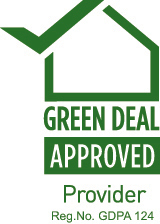 We are, of course, an approved Green Deal Provider, with all the necessary guarantees, warranties and insurance in place to give you complete peace of mind. Please visit our Green Deal Provider compliance page for full details. If you’d like more information, or to book an assessment or request a quote, please complete the form below or call the Green Deal team in Manchester on 0161 6153762. Please tell us what energy efficient improvements you would like (for example, loft insulation, a new boiler, solar panels etc) and/or what measures your Green Deal assessment recommends (if you have one).